Fun and Stylish High Heel Shoe Shaped Chairs! Fun and Stylish High Heel Shoe Shaped Chairs for Teen Girls! Even though I am not a teen girl anymore, I immediately fell in love with these fun and very stylish high heel shoe shaped chairs when I first came across them a couple of years ago. I think they are absolutely fabulous!! Teenage girls LOVE to have the coolest bedroom they possibly can and they also love to have fun sleepovers with their best friends! 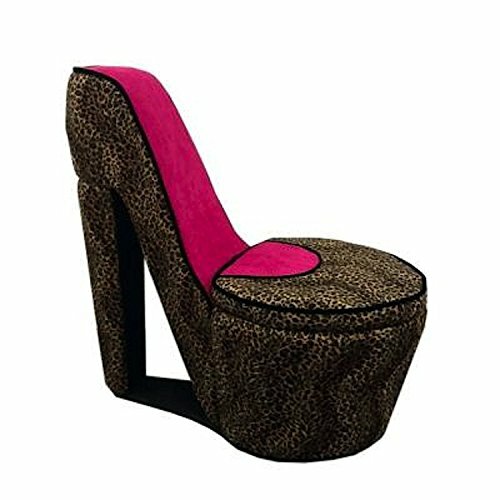 *This one for example is a gorgeous cheetah print fabric stylish high heel accent chair with storage! It is made from wood and foam, so it is also very comfy! You can also have one of these in your living-room, for decorative purposes! They come in several beautiful colors and designs! 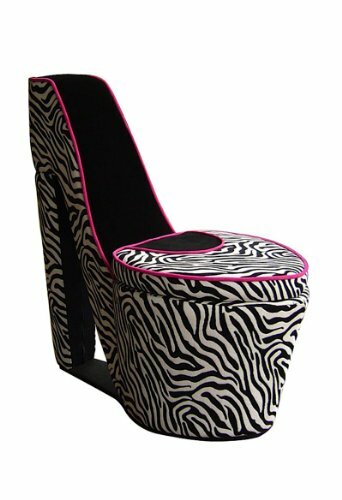 This is one of my favorite high heel shoe shaped chairs for teen girls being sold! Perfect to create a fun pink bedroom for your teen! Just get a beautiful pink comforter set, pink curtains and a pink rug! Great for listening to music or reading a book too! Beautiful Purple and Black High Heel Shaped Shoe Chair! Will look great on a nice corner, maybe near your bookshelf. Even better if you also have a black sofa set! Also perfect for your teenage girl’s bedroom, specially if she likes dark colors. Also made using a hardwood frame. If you put it in the bedroom, my suggestion again is to also get a beautiful dark purple bedding set and maybe some black curtains. 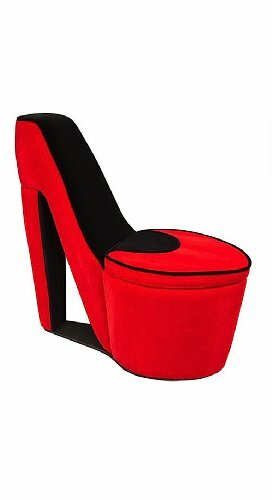 *Gorgeous Black and Red Fabric High Heel Accent Shoe Chair for Sale! 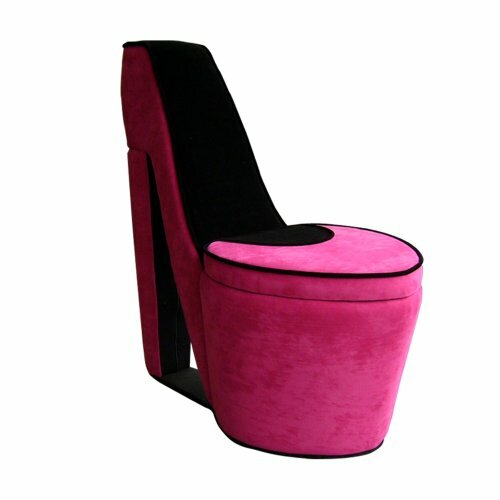 Another gorgeous and super fashion high heel shoe shaped chair for sale! I love the red and black color combination! The fabric is super soft as well and the chair is made of wood and foam! Perfect to have by a bright window and enjoy your favorite book! The hidden storage space is also very spacious. Perfect for a fun zebra bedroom! Yes, you know what I’m going to say! Also get a fun zebra comforter set and some zebra curtains! Trust me, your teen girl’s bedroom is going to look awesome!! *Watch this cute bulldog getting acquainted with the new zebra high heel chair in this home! Too cute and funny for words! 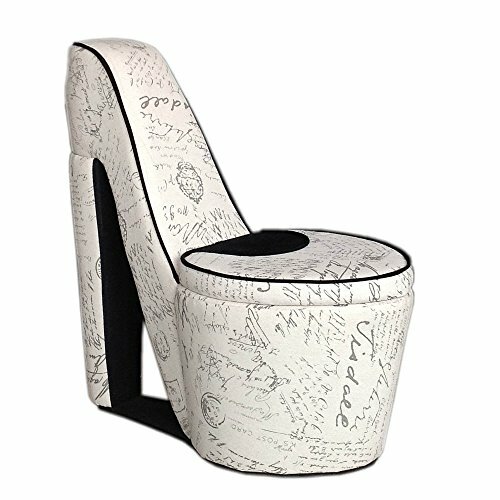 This is one of the most unique high heel shoe chairs with storage ottoman! It has a fun scribble pattern all over and it’s white! Very stylish! The frame is made with solid wood and the storage compartment is just perfect to place school stuff or magazines! *I hope you had fun here today browsing through these awesome high heel shaped chairs! Here are more cool chair ideas! Does this shoe come in a light pink? Hi Keisha, so far I have only seen them in hot pink but I’m gonna start searching for a light pink one and see what I find… thank you!